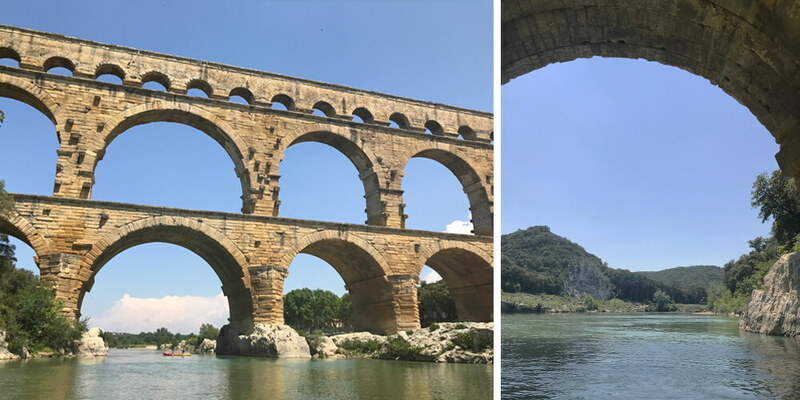 Being in the Gard department, you kind of have to go to the Pont du Gard. 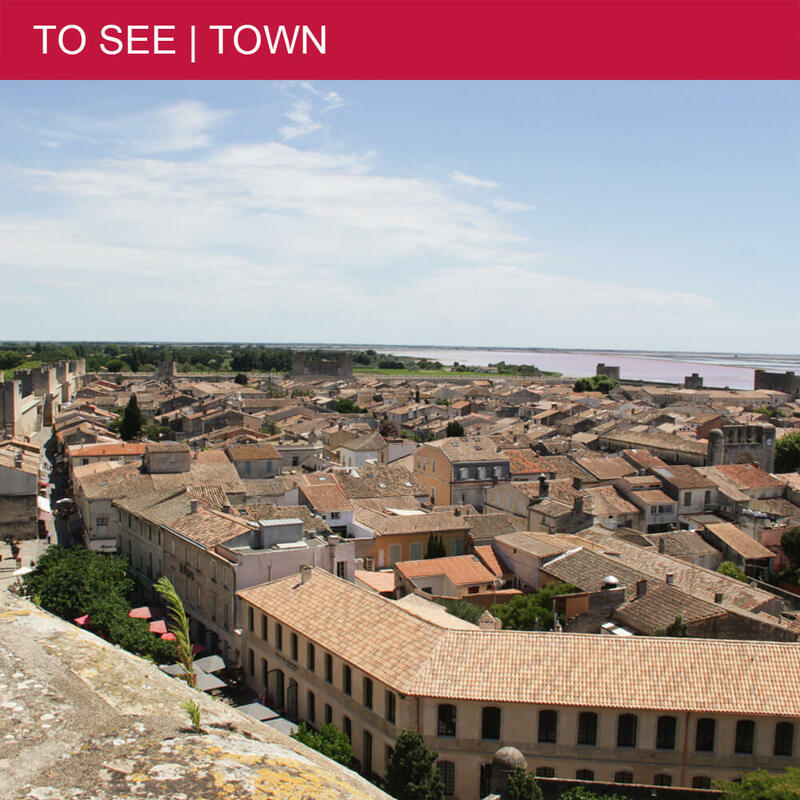 This famous 2,000-year-old Roman aqueduct is a UNESCO World Heritage site and a popular sightseeing destination. 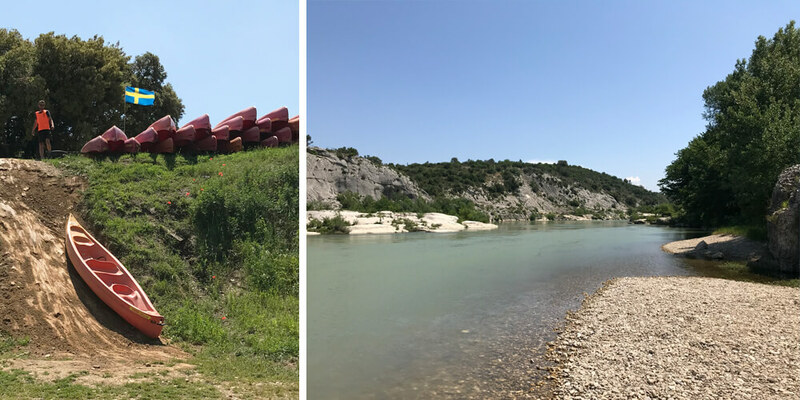 When visiting for the first time, I already noticed the kayakers on the Gardon River. 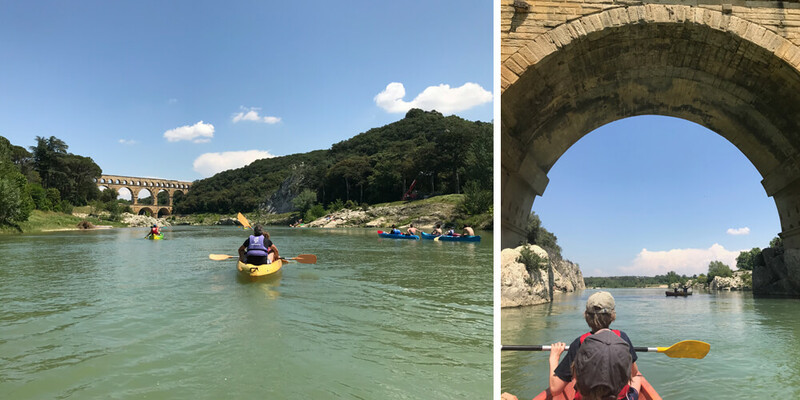 During our last visit, I wanted our little family to experience the Pont du Gard from a different point of view: from the water. 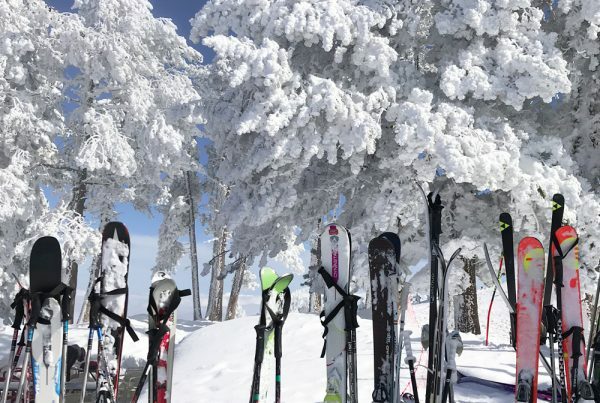 On a gorgeous day, we went off to our expedition. 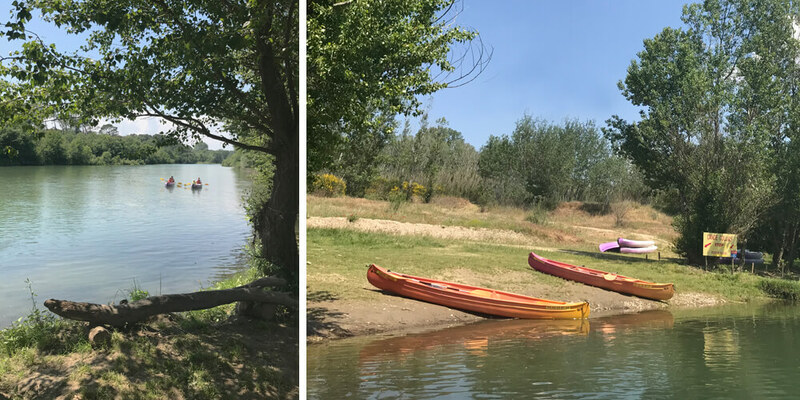 There are several kayak rentals on the Gardon River; we went for Canoë Collias. They are friendly, easygoing and helpful. Good weather: check. Kids above six years old: check. Life jacket: check. Closed-toe shoes: check. Waterproof storage container: check. Picnic: check. Two kayaks: check double check! We left from the right side of the river (rive droite). In order to come back, we had to reserve the pick up in advance. As the water was high and current quite strong, the kayak guy estimated we needed one hour and a half to kayak about 8 kilometres. Normally it will take you approximately 2 hours. I included some picnic and swimming time, and we were good to go! The boys and the girls each shared a kayak. Right from the start, the scenery is amazing. 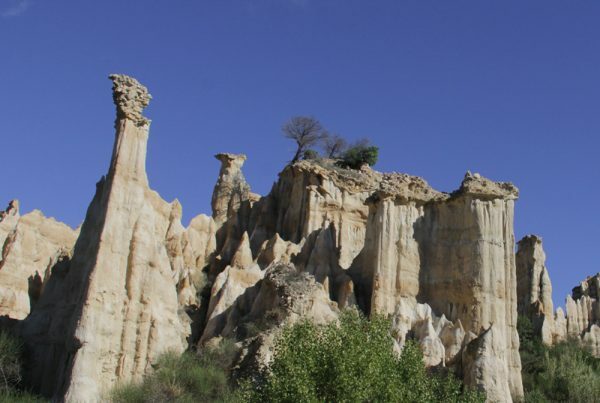 Through a landscape of calcareous rocks flows the Gardon River. The emerald green water matched very well with the lush banks and bright blue sky. And it was so peaceful! Well, that was until the boys decided to do a competition to see who would be the fastest… Soon enough we found the perfect picnic spot. Our packed lunch tasted so much better in this gorgeous natural setting. After this short stop, we changed places and I paddled with our two boys. They were still in competition mode. We didn’t win though. The boys weren’t too happy when they discovered I was busy taking pictures in the back :). Our daughter and chéri happily waved at us from under the Pont du Gard. As I tried to go as slow as possible, the boys managed to go under the bridge, eh, aqueduct, as well. An impressive moment, although the whole kayak trip was spectacular. 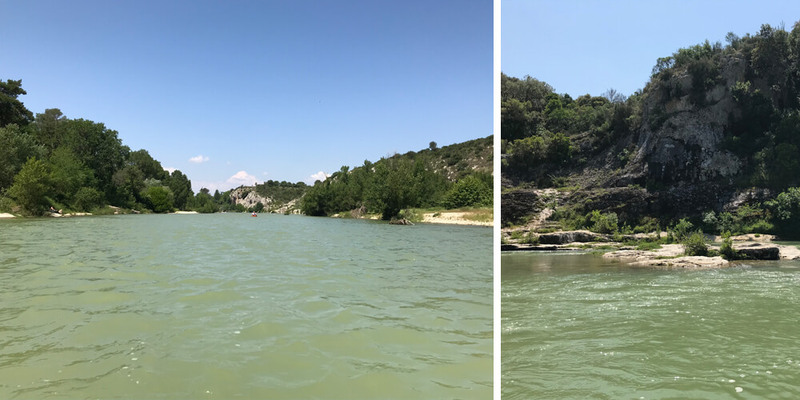 From the Pont du Gard, it takes another 20 minutes to arrive at the pick up point. When we started the trip, I asked the kayak guy if it would be difficult. He said it was doable, but because of the high water, it might be a bit hard. So I was quite nervous to start kayaking. However, it was such a pleasant and peaceful trip. Apart from a few faster-flowing sections, the water was calm and clear. And cold! But we’re tough cookies, so we ended our kayak trip with a dip in the river. 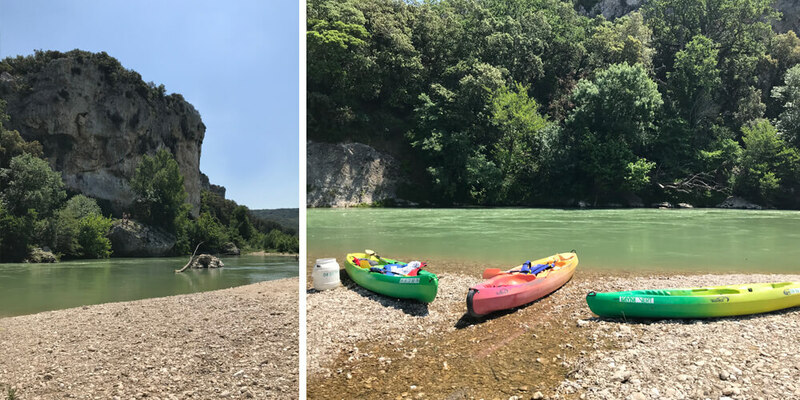 There are many kayak and canoe rentals that offer a trip under the Pont du Gard. 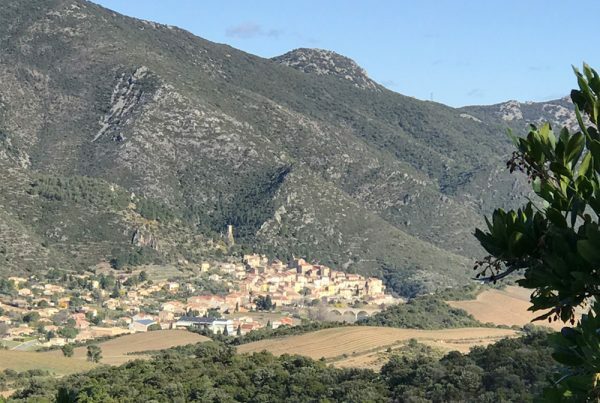 If you are with a family, the village of Collias is a good starting point. From here, it will take about 8 kilometres to the Pont du Gard. We rented our kayaks at Canoë Collias. They have two bases, the main base with reception is on the right side of the river, a smaller base is on the left side. They also organise longer kayak and canoe trips, check their website for more information.